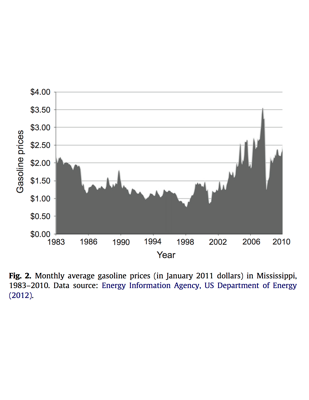 The impact of gasoline price changes on traffic safety has received increasing attention in empirical studies. In this study, we use time geography to provide a theoretical framework for examining the effects of time-varying fluctuations in gasoline prices and their relationship to traffic safety in a case study of Mississippi from April 2004 to December 2010. Application of time geography theory suggests that gasoline prices act as one type of capability constraint of the space–time path. As gasoline prices increase (that is, as the capability constraint becomes stronger), we hypothesize traffic crash rates decrease, and they decrease more for groups for whom the constraint is stronger. The results corroborate the hypotheses and suggest that gasoline prices have stronger effects on reducing less severe crashes and negligible effects on reducing fatal crashes. Gasoline price effects on reducing crashes start at a 9-month lag, peak at a 12-month lag, and diminish after an 18-month lag. As commentary, the recent increase in crashes this last year (2012 vs. 2011) as the effects of the recession wane (and the budgetary constraints on travel relax) provides corroborative evidence. Happy Sesquicentennial to the London Underground. In its honor, I relink to a movie of London’s growth from 1801. More movies and higher resolution here. In 1998 I bought a Subaru Forester at Albany Subaru in California. We test drove two all-wheel-drive vehicles with high reliability, it and the Outback. We asked Jeff, the salesman, which car would be better in the post-apocalypse. He said the Forester. In the event, that need has not arisen (yet), but the car was surprisingly useful once I took a job in Minnesota, the White Subaru being the car-du-jour of the Minneapolis Winter. When I moved to Minnesota, the car was still mortgaged to a California Credit Union, but I dutifully transferred license plates. We paid off the car sometime around 2001, and thus owned it outright. I never received the title, it was probably never sent, or may have been sent to my old California address. One never looks for things one is not expecting. For 11 years, this never mattered. (4) abandon it on the street to be picked apart by recyclers. To get it off the lot, or get anything out of the car, you have to pay rent to St. Paul. Since we still had things in the car, we paid the rent. Then AAA helpfully towed the car to the front of my house. 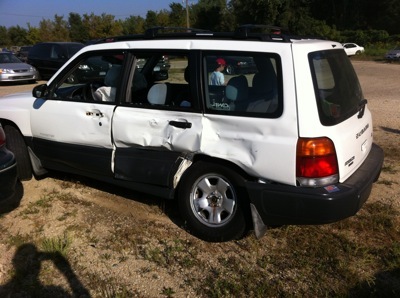 However the car was barely operational. Surely it would be picked up in a day or two. I quickly realized that was not to be. I concluded after about a day I did not want to drag down property values in my neighborhood anymore with the unrepaired eyesore, and burned some rubber (the driver side rear tire was bent inward and so created a burning rubber smell when it moved, but it did move while making an awful noise and mechanically the car still worked) and drove the car from the front of my house to my garage in the back alley. Anyway, we wanted the second option, as it would give us a tax deduction. Unfortunately, all the charities require a title. I searched my otherwise complete records. I had no title. (I had every insurance form since 1998, and every car care receipt, but no title). A charity helpfully informed the car title was registered in California. I obtained a notarized lien release letter from my Credit Union, who is remarkably at the same address and phone number as 12 years ago. At the beginning of September, I filled out a form and sent a check, with the lien release, and asked California to send me the title. About a month later I received a letter in reply returning the check uncashed saying they don’t keep records older than 4 years. The next day, I sent a letter to Minnesota, filling out a form, with various explanations, asking to transfer title from California to Minnesota, with a check, a copy of the letter from California, and the lien release notice from the original lender. A few weeks later I got back a letter, with my original attachments, the check uncashed, saying that was the wrong form, and I need to send them a letter with a different form, asking for a title for untitled vehicles, rather than a transfer. I sent them the new form. A few weeks later, they sent back a letter asking me to send them the letter from California and the notice from the Credit Union that they held no lien on the car. Naively I assumed they didn’t need that again, since they saw it the first time. Surely they would scan it and have it in their records. So I resent the new form, with the letter from California and the lien release. Success, finally in the beginning of December, I received a title in the mail from the State of Minnesota. The next day, we went to Newgate School, which teaches car repair, and gave them the title and the keys to the car. I held the title for less than 24 hours. Two days later, they towed the vehicle from our garage. I hope someone learns something about bodywork, and someone else gets a decent car in return. We got our garage back, which the new car barely fits. I thought about calling this post “DMV: Or why people hate their government”. People often have unpleasant experiences with their government, especially the bureaucratic end (as opposed to the other non-bureaucratic end, like ?). DMV is perhaps the most common and most regular, but I could discuss the planning and permitting offices of local government, which are needlessly bureaucratic and succeed in preventing me from legally doing ethically reasonable things with my property. I don’t want to pick on Minnesota DMV (technically Driver and Vehicle Services here), since when I get my driver’s license, the line is far shorter than say it was in Maryland or California. My main gripe has been the annual vehicle registration DVS has. I can do it online, if I pay an extra fee, or I can do it the old-fashioned way and write a check, which is cheaper to me, and must be costlier to them. Does no-one think about incentives? Further, it was clear what I wanted on my first letter to them (the title to my car which they know I own and I have registered legally here for 13 years), they should have been able to handle it, or called and asked if they could tick a different box on a different form if that is what makes their databases happy. I could have done this in person, but mailing a letter is faster in terms of using less of my scarce time, though not faster in terms of solving the problem in real-time. In short, I would like people to think about ends and not just means. California really shouldn’t be dumping data after 4 years either (are hard drives that expensive?). They must have some privacy rationale, but really, this is a car title, it is in the national registry, they should have been able to handle this too.